“I feel the art that I do is breaking a new genre of art that people have never seen.” – Pauline Coxon. Photo: Ian Campbell. Pauline Coxon is a Biripi woman living on Ngarigo Country. “Life brought me down this way six years ago and I’ve gone along with the flow,” she says. 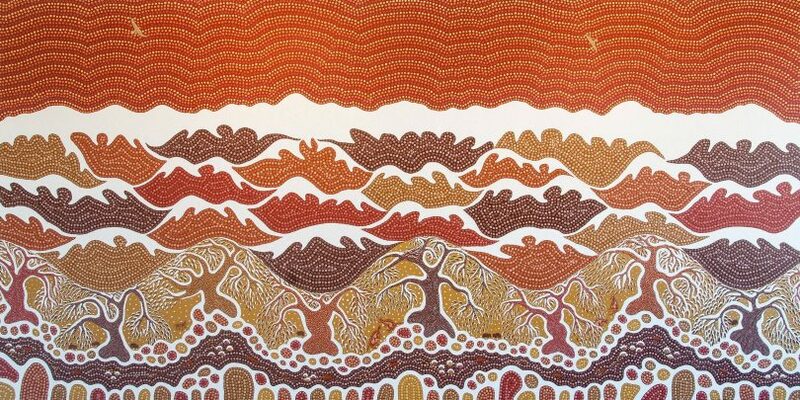 It’s a sentiment that is reflected in Pauline’s artworks, which are a mix of traditional Aboriginal dot art and more modern strokes. “I am a descendant of the Barrington Tops, another place of mountains and snow,” she says. “I respect the place of Ngarigo woman who, through art, tell the stories of the Snowy Mountains. “Wedgetail Eagles on Sunset on the Main Range of Mt Koz.” by Pauline Coxon. Photo: Pauline Coxon Art Gallery Facebook. Pauline describes herself as a contemporary Aboriginal artist, mixing cultures, stories, and moments in time. The morning I sat in her gallery at Berridale, Pauline was working on a large piece that would take in six canvas panels and feature a female snowboarder mixed with traditional Aboriginal designs. 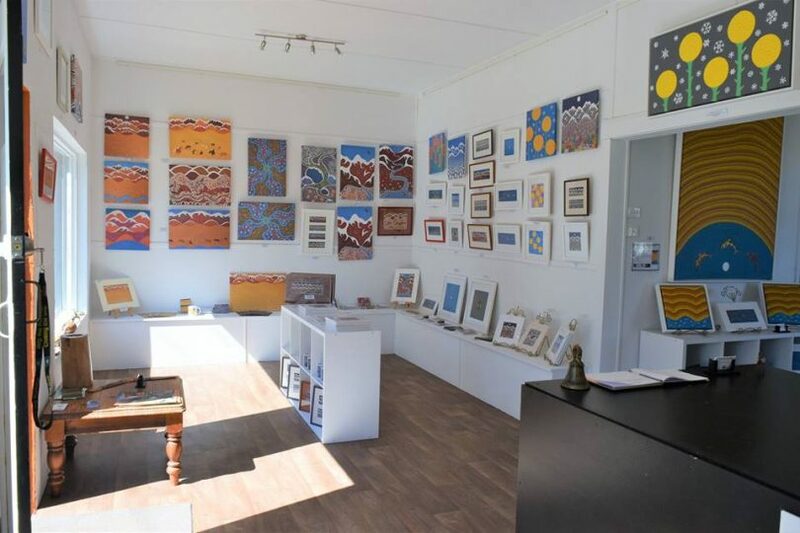 Pauline rejoices in what she describes as a growing celebration of Aboriginality coming through her gallery to buy works and talk about culture. “We have grown as Australians to understand we have our own art, we have our own culture and that we are a diverse arts community,” she says. Inside the Pauline Coxon Art Gallery at Berridale. Photo: Pauline Coxon Art Gallery Facebook. Aside from being a celebration of people and place, Pauline believes in the healing power of art, especially when it comes to the trauma experienced by Aboriginal people during recent history. “I was an artist as a child, but drifted away from it and ended up working in the social welfare area and burnt myself out,” Pauline smiles. “I found myself unemployed at one stage and remembered that I used to paint. Laughing, Pauline talks about letting the emotion she feels for her art, not burn her out again. “Ian, I seem to learn about life the hard way,” she says. The Pauline Coxon Art Gallery is a traffic stopper. Photo: Ian Campbell. 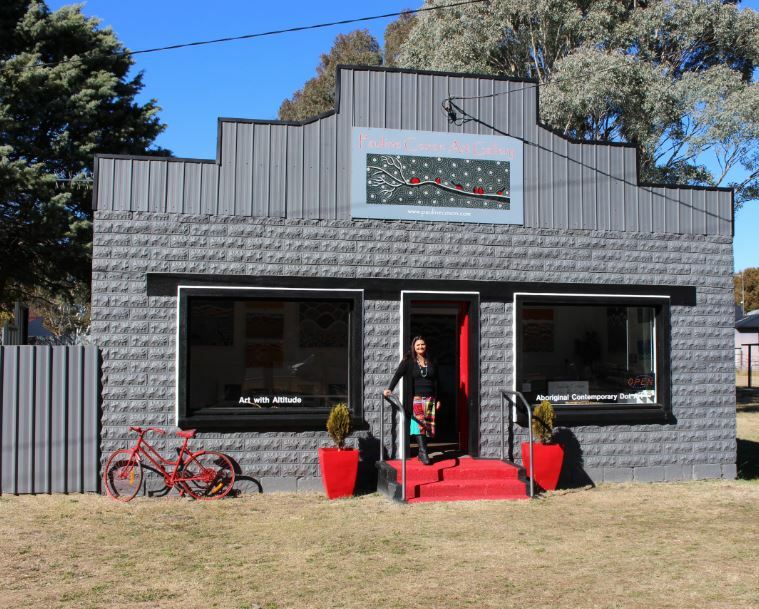 Over the last four years, Pauline has turned her talent and “leap of faith” into a business that is the talk of the Snowy Mountains. 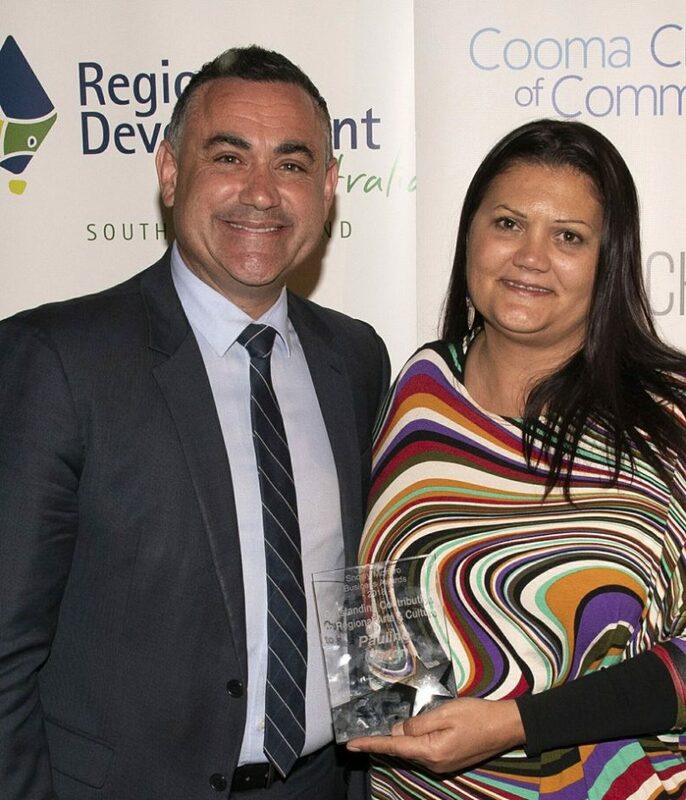 At the recent Snowy Monaro Business Awards she received a special award for Outstanding Contribution to Regional Art and Culture. In accepting the award in front of 200 peers, she became emotional. “Buying the building and renovating, and starting from scratch on a very low budget and questioning the decisions I make along the way – is this business decision the right one? That’s been a lot of pressure,” Pauline explains. Pauline Coxon with the NSW Deputy Premier and Member for Monaro, John Barilaro at the Snowy Monaro Business Awards. Photo: Pauline Coxon Art Gallery Facebook. Pauline accepts that she is not a natural member of the local Aboriginal community and acknowledges Ngarigo elders and tradition in her work and how she presents herself to the world, but there is no denying the affection and admiration many in the Snowy Monaro community have for her. In 2015 and 2018, Snowy Mountains Cookies commissioned Pauline to design the artwork for their food boxes to be served as part of the in-flight service on Qantas Airlines. “When you start off as an artist, no one knows you, and you just need the right people that love your art, believe in you, and offer you wonderful opportunities – that’s Nolen and Daisy [Snowy Mountains Cookies],” Pauline says. 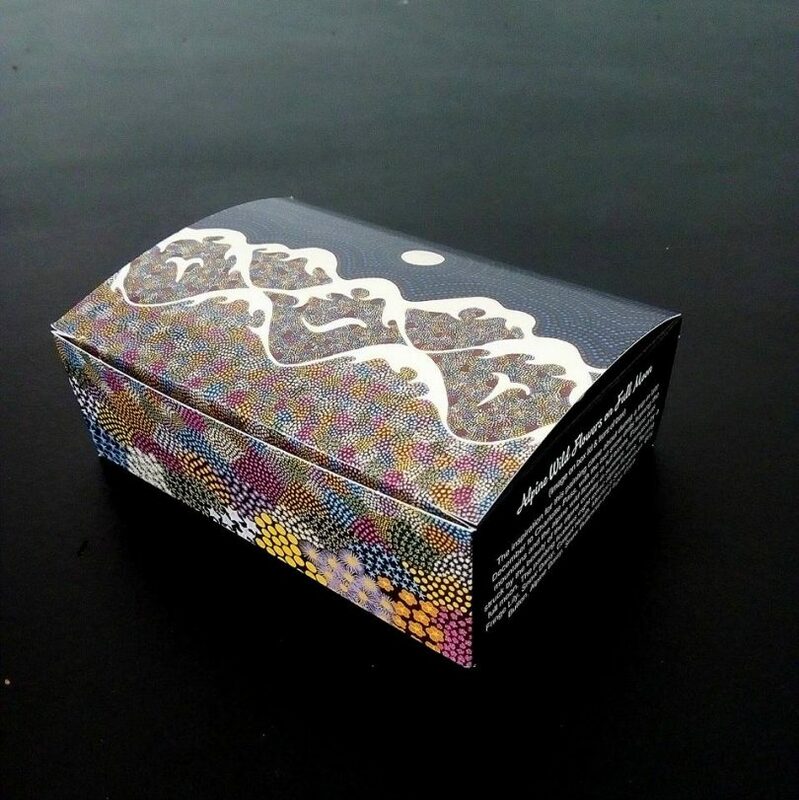 The cookie box designed by Pauline Coxon for Snowy Mountains Cookies. Photo: Pauline Coxon Art Gallery Facebook. 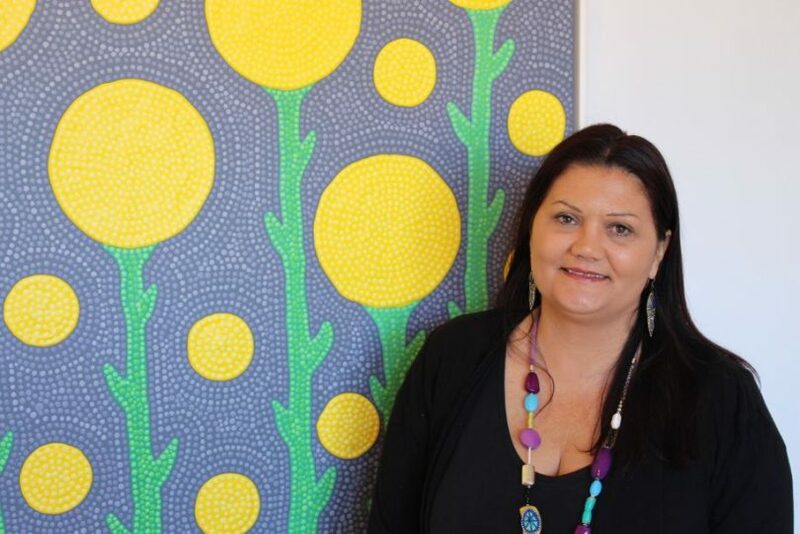 On top of continuing to build her own business, Pauline is passionate about fostering other Aboriginal artists and points people towards the upcoming NAIDOC exhibition at the Raglan Galley in Cooma starting July 7. “I am really excited about being behind the scenes and supporting all these new Aboriginal faces and sharing that with the whole community,” she says. With that, Pauline reflects on the women in her life who continue to inspire and shape her direction. “My two Grandmothers; my Mum is German and my Dad is Aboriginal, I love my multiple nationalities, I take a lot from my German Grandmother, Elsa and my Aboriginal Nanna, Eileen, both completely different women but I take the best from both,” she says. 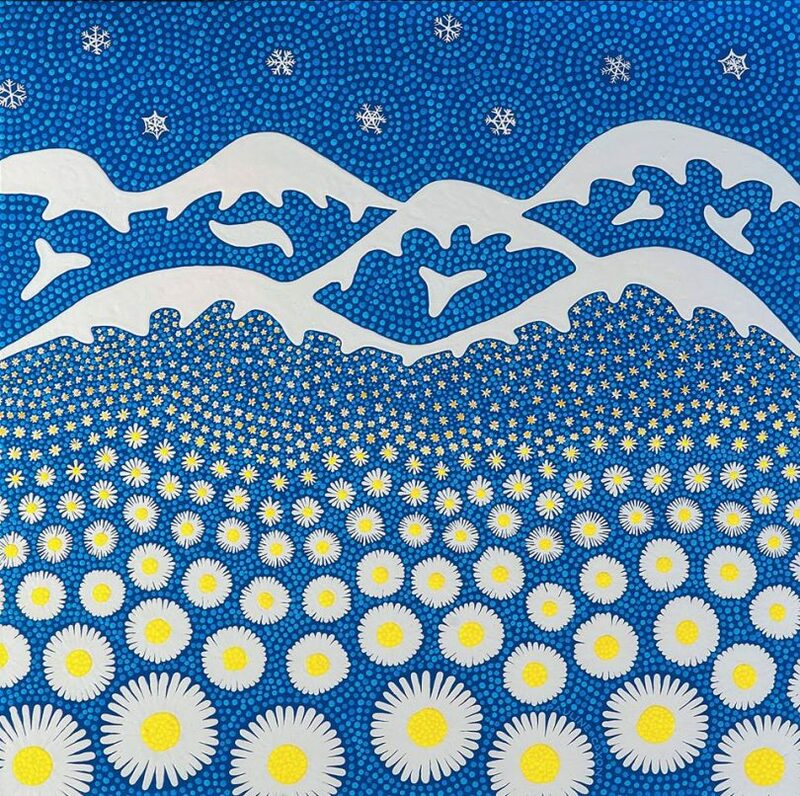 “Snow Daisies” by Pauline Coxon. Photo: Pauline Coxon Art Gallery Facebook. There’s a respect for the past, drive to be better, and desire to inspire others that almost seems to be an uncontrollable force that pushes Pauline forward. Feeling the need to allow Pauline to get back to her painting, I ask about future plans for her thriving gallery as a way of wrapping up the interview. “This building was originally owned and built by a gentleman named Arthur Costello. Anyone that was part of the Snowy Scheme knew Arthur, he was a famous Irish boxer who won a world title in Ireland and came over here,” Pauline explains. “He was a bit of a larrikin, he used to hold boxing and betting rings up in the mountains with the Snowy Hydro Scheme. Acknowledging the building’s past, Pauline and her husband are extending the building to include living quarters, a possible cafe, and studio space for other Aboriginal artists. As another busy snow season approaches, Pauline takes a deep breath and prepares for new people to discover her art and charm, and I know all involved will be better for it.